Poverty is no excuse not to grow up to become respectful and responsible people. That’s what the children of Burris Eulon Ray and wife Malinda Jane Savage Ray were taught when they were young. Eulon, or Rack Ray, as he was known by, and his wife, Jane, moved around to several places in this area after they married, and for a period of three years, lived and worked in Florida before moving back to Tennessee. 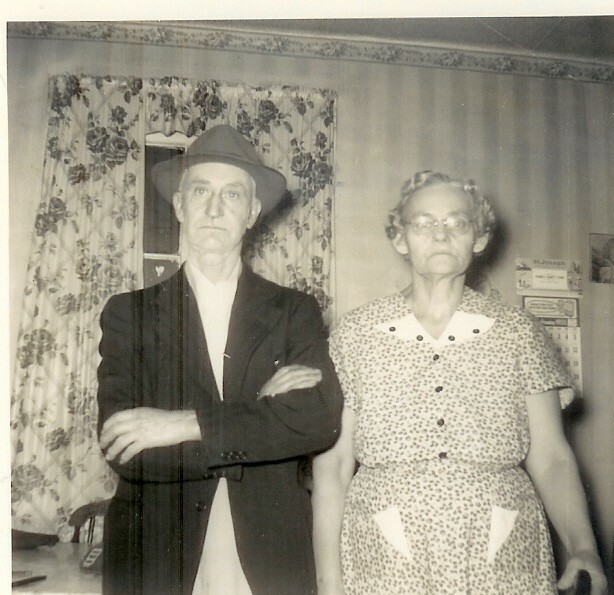 Eulon was a sharecropper, but also had odd jobs that included saw mill and janitor work. At the time the property was condemned for Standing Stone State Park, the Rays lived and sharecropped on land owned by Lewis and Kate Bilbrey in the Cave Springs area near Allons. The period of time they lived in Florida, both Eulon and Jane worked in vegetable packing plants. Eulon and Jane Ray photographed in their home on what is now Evans Street. There were seven children in the Ray family, six boys and one girl. 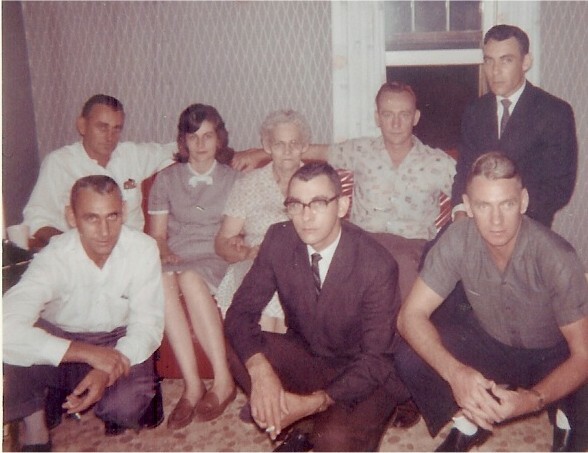 Their names are Wilburn Gerald; Fred Noel; Charlie Edmond; Robert Gaskell; Clifford Owen; Terry Gene, and Ollie Sue. Someone once asked Eulon how many children he had. He replied that he had six boys and that each of those boys had a sister. The answer confused the man who asked the questions, so he said, "You have twelve children?" Mr. Ray replied, "No, I have six boys and one girl." One of the places the Ray family lived was in a home on Linder Mountain. From there, those who were old enough to attend school walked to Howard’s Chapel. All eight grades were taught in one room. Fern Mitchell was one of the teachers there. That building once stood in the area most refer to today as Twin Oakes. Clifford described their childhood like this: "We shared whatever we had, and made do with very little." He said there were many times when one stick of gum was divided into equal number of pieces for all of them. After Wilburn and Fred were old enough to leave home, Gaskell and Charlie took on the responsibility of helping care for their younger siblings. Gaskell told me he considers his childhood a happy one, and his other brothers and sister, Sue, agreed with this saying that he went around whistling and singing most of the time. It was Gaskell’s job to help their mother with the milking while Charlie helped their father with other chores. Often Gaskell walked from Linder Mountain to take cream and eggs to the square in Livingston to be sold for stables. Clifford remembers how their father insisted the corn continue to be chopped out long after it stood above the boys’ heads. Something the Ray children liked to do for fun was to get inside an old tire and roll down a hill. Using a shoe last for a toy car was another way they played. (Just in case there are some who might not know what a shoe last is, here is a definition: A last is the form used in shoemaking to shape a shoe in the rough form of a human foot.) The boys once put a western saddle on a steer and Charlie climbed on to take a ride. That didn’t last too long. The steer threw both Charlie and the saddle off, but thankfully, Charlie wasn’t injured. Discipline was something both Eulon and Jane did. Sometimes punishment would consist of sending the children out to get a switch, and other times, their father would set a time the next day when the punishment would be rendered. Terry told me the time would often be at 4:00 the next day, and try as he might, he could never get on his father’s good side before that time arrived. The punishment was carried out just as their dad promised it would be. Sue said that when her parents sat them down to talk with them about something they had done, that hurt much worse than getting a spanking did. Something Jane Ray always told her children over and over was "You kids be good to one another!" Both Eulon and Jane also stressed to their children that they be respectful of people in authority, of people older than they were, and to treat other people as they wanted to be treated themselves. The Ray children were always taught to be careful with the clothes they wore on Saturdays because they knew those same clothes would have to be worn on Sundays as well. Because of not having closets in the homes they lived in, nails were driven in the walls for each one to hang their clothes on. Jane Ray always made sure the children’s clothes were clean and starched, even though they might have lots of patches on everything they wore. Many times after doing a washing, she ironed clothes dry with a iron that was heated on a wood cook stove. The Ray family photo was made at the time Mr. Ray had just passed away. Front row: Fred; Clifford; and Charlie. Back row: Wilburn; Sue; Mrs. Ray; Gaskell; and Terry. One of the first jobs Gaskell had was working for Dillis Benson at a service station he had on East Main Street. He was paid one dollar a day. A second job he had was working at the rock quarry using a 16 pound sledge hammer to break up large rocks. Charlie also had a job working there using a sledge hammer. This may account for the fact they often settled their differences using those muscles they build up swinging a sledge hammer. Christmas for the Ray kids sometimes included a stocking with peppermint candy or fruit, something they considered a wonderful treat. Little tin trucks from Young’s Variety Store were sometimes gifts the boys got. One year Sue remembers they each got a little brown paper bag with five pieces of peppermint candy in it. She also recalls a Christmas when she asked for Santa to bring her a little red rocking chair. Since they had a fire in the fireplace, she knew if Santa granted her wish, he would not be able to come down their chimney and would have to come in the front door. Sure enough that Christmas, Santa knocked at the door with the little red rocking chair for Sue, but it was really Charlie playing the part of Santa. One Christmas, Gaskell remembers when he and Charles Lewis Bilbrey found a bag of oranges Lewis Bilbrey had hidden for his family for the holidays. They ate several of the oranges and then decided to taste of the icing on a cake Charles Lewis’ mother, Kate, had baked for Christmas. Instead of just tasting of the icing, they ended up eating all the icing off the cake. Having later lived in the same neighborhood as Lewis and Kate Bilbrey did when I was growing up, I can just imagine Mrs. Kate’s reaction when she found her cake after the icing was eaten! Gaskell said the first time he ate a piece of loaf bread was at the Bilbrey home, and he liked it so well, he ate several slices. His mother always had biscuits and cornbread for their family, so loaf bread was something new and he really liked the taste. But after Gaskell had eaten several slices, Lewis Bilbrey put a stop to that by saying, "Boy, don’t you know bread costs eleven cents a loaf!" Sue told me most people assume she had it really rough being the only girl with six older brothers, but just the opposite was true. All her brothers really looked out and cared for their little sister. One of her favorite memories was a little green corduroy jumper and a white blouse that Charlie got for her just before she started to school. She said that was her very favorite outfit and she loved it dearly. Another memory Sue shared was asking to go to a Fourth of July celebration, even though she had no idea what that meant. She knew it must be something special, but really didn’t understand what it was about. Clifford said he would take her, but what he did was to walk down to the creek with her, tell her to pick up a rock and toss it in the creek, which she did, and then told her that was a Fourth of July celebration. She said she had always completely trusted all of her brothers, so she didn’t question Clifford about this at all, and never knew the difference for a long time. Sue remembers waiting for Fred to return home on leave from the Marines one time. On this particular trip, he came home across a field, but Sue saw him long before he got near the house. She ran and told her mother Fred was home, but her mother didn’t think he was due in until the next day. Sue assured her mother it was Fred because he had a uniform on. She was right, it was Fred. One of the things Terry did after Fred got home was to pinch him on the neck. He said he heard that Marines were called "leathernecks" and he wanted to see if Fred had really become one after going in the service. Terry shared some memories of working as a shoe shine boy on the square in Livingston when he was young. The cost for shining a pair of shoes was one nickel. Terry also worked at the Ritz Theater, as many young boys his age did. He said would always remember how caring and helpful Fred Rose, one of the owners of the Ritz, was during the time he worked there. He said that Fred really looked out for all the boys who worked there. Selling popcorn was another job he had at the Ritz. It regularly sold for a dime a bag, but Terry would often put it on sale two for a quarter and it sold better that way than at the regular price. Another job Terry had in his younger days was washing cars at the Ford garage for Aubrey McCormick. The charge for getting a car washed and cleaned thoroughly was $1.00. Terry was paid $25.00 a week while he worked there. Another memory Terry shared with me was a time Gaskell took him and Sue when they were both small to the Ritz Theater to see the movie "Snow White." That was a real treat for them. Eulon Ray eventually bought a home on what is now Evans Street in Livingston. By that time, Jane Ray had a job with the Maynard family who owned Ideal Laundry. She worked there approximately twelve years. She would sometimes take blue jeans her children wore and press them there. Terry said because they were starched and pressed so well, he would have to run his arm down the legs before he could put them on. Both he and Sue said they just loved to wear those jeans their mother took to work with her to press. After Jane retired from the laundry, she helped out some at the Parkway Restaurant during the time Charlie and wife Mary Jo owned it. Two of Jane’s favorite customers who frequented the Parkway and loved to aggravate her there were Jack Pigg and Charlie Gentry. Jack was also known to pull pranks on Mary Jo. On one occasion, he ran the clock up an hour, and after preparing lunch that day, Mary Jo couldn’t figure out why no one showed up at the usual time to eat. But Jack knew. Each of the Ray children, all now retired, have each done well with their lives. Wilburn (deceased) became a draftsman after receiving training in the service; Fred (deceased) went into the refrigeration business; Charlie has been in the trucking and restaurant business; he ran unsuccessfully for Sheriff of Overton County two times against the incumbent Ernest West; Gaskell became an electrician; Clifford worked in Social Security Administration; Terry became a medical technician administrator; and Sue worked for many years with Firestone Rubber Company. One of the things Charlie told me about their extremely close knit family is that, "We had a lot of differences of opinion, but never enough not to always speak to one another." Sue said, "Passing down to our children and grandchildren all the things Mom and Dad taught us is something else we’ve all tried our best to do." Just spending some time with this family for an interview, it’s quite obvious Eulon and Jane Ray’s beliefs and teachings continue to be a part in each of the children’s lives, and the one thing their mother always told them about being good to each other has never been forgotten.